Dial **21* + the phone number including area code, followed by #. A confirmation message is displayed on your device letting you know that call forwarding has been turned on. A confirmation message is displayed on your device letting you know that call forwarding has been turned off. 1. Visit your local T-Mobile store to purchase/order one in store. Some stores carry them, otherwise you will need to make an in-store order - Call local store before you go, so you can know what to expect. 2. T-Mobile sales 800-866-2453 or Care 1-877-347-2127. The devices cost is $99 + tax/shipping. For current customers, your account is already notated to allow the purchase. 1. There is a deposit required of $350 + $7 charge for shipping. There’s no reason to stay stuck anymore. Break free. Can’t get the phone or plan you want—all because you’re stuck in a dead-end service contract? Think again. We will pay your Early Termination Fee (ETF) with a Visa® Prepaid card or a check—and never make you sign another annual service contract. 1. Get up to $350 per line based on the Early Termination Fees (ETFs) stated on your carrier’s final bill. (limit 10 per account) Qualifying wireless carriers are Verizon wireless, AT&T or Sprint ONLY. You MUST be in a contract with a ETF charged to your account and service MUST be terminated as a DIRECT result of the port out to Harbor/T-mobile. 2. Keep your line on any of our 4 qualifying plans active (must be a phone based voice/data plan, the wearable or data plan does not qualify) through Harbor for 120 consecutive days of service (After your 4th monthly payment.) Your account must remain current during the 120 day period. 3. Submit a receipt/proof of purchase indicating the purchase of a T-Mobile branded handset (at full price) from any T-mobile store or T-mobile.com - CANNOT be be from stores like Walmart or even the apple store (within the last 30 days) and use that device on the new line with Harbor. 6. Be sure NOT to cancel your line with your current wireless carrier. Only until AFTER your line has successfully ported into Harbor should you ensure the line has closed out. 1. When you receive your current carrier’s final bill with your Early Termination Fees (ETFs), please submit the final bill along with the receipt of payment for the device you purchased (in PDF form) to support@harbormobile.com with subject ETF CREDIT within 2 calendar months of your number transfer to T-Mobile/Harbor for reimbursement (up to 10 lines). 2. The email MUST be all in one email and not multiple. Give me all I need to know about roaming overseas, like can I roam for extended periods of time? International roaming can only be enabled after 30 days of service with Harbor. Standard speeds approx. 128 Kbps. No tethering. Not for extended international use; you must reside in the U.S. and primary usage must occur on our U.S. network. Device must register on our U.S. network before international use. Service may be terminated or restricted for excessive roaming or misuse. Texting and data are included in all plans at no extra cost. Voice usage, including incoming and outgoing calls, as well as voicemail retrieval, are not free and will be charged $0.35 per minute. Refer to the "Enable/Troubleshoot International Roaming" FAQ under the International Calling/Roaming section for the terms of unlocking international roaming. When will my sim card get shipped? Sims are shipped out same business day providing order is placed before the cut off time indicated below. Your proximity to our shipping warehouse on the east coast will determine the amount of days it will take for the sim card to reach you. Generally, it can take up to 5 business days to reach its destination. If you are trying to "time" your order to coincide with the end of a billing cycle, give yourself a little leeway so that there is no lapse in service. If porting, ensure that you have enough time to receive your sim and port your number over before your current carriers billing cycle is up. Porting out of a inactive account is blocked by many carriers. Once shipped, your tracking number can be found in your account portal. This portal update usually happens by the next business day. Who are these plans for? Harbor, an official T-Mobile business re-seller created plans that target businesses, entrepreneurs and sole proprietors bringing them over to the powerful T-Mobile network. Can I activate a new T-Mobile SIM card with your service? Great question! The choice is yours. 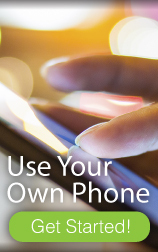 You may either purchase a sim card though Harbor or you may bring your own sim. 1. MUST be T-Mobile branded (not co-branded/MVNO) 2. It MUST be new and unused. It WILL NOT work if these conditions are not met. The option to choose whether to use your own sim or purchase one through Harbor is on step #3. Is the T-Mobile #MUSICFREEDOM (no data cap on music streaming) included? T-Mobile is setting music free. Stream as much music as you want on your smartphone from top streaming services, including Google Play Music, Pandora, iHeartRadio, iTunes Radio, Rhapsody, Slacker, Spotify, AccuRadio, Black Planet, Grooveshark, Radio Paradise, Rdio and Songza, Milk Music, Xbox Music, SoundCloud, RadioTunes, Digitally Imported, Fit Radio, Fresca Radio, JAZZRADIO, Live365, Mad Genius Radio, radioPup, radio.com, ROCKRADIO and Saavn - and it won’t count towards your 4G LTE data plan. Data charges do not apply! Please note, that access to the actual music streaming services are NOT included, rather just that the data which they use will not count towards your high speed data allotment of your plan. These plans seem too good to be true, how is this possible? We like your thinking! We have opted to eliminate multi-million dollar marketing campaigns in favor of passing those savings on to you. You like it? Pass it on to your colleagues so that they can join the fun too. In addition, Harbor is a T-Mobile re-seller that focuses on delivering high value services to its network. Can I keep my number or bring my number over from my current carrier? YES, as long as it is not from T-Mobile, and it's free! 1st, be sure to check it's portability on http://www.t-mobile.com/switch/ to ensure you can bring it over. Once you receive your sim card, you will fill out the NUMBER PORTING FORM which is processed within 24 hours. You may port in a number from virtually any carrier in the nation except from T-Mobile itself. You should not have any down-time as the actual transfer is instant. 1. 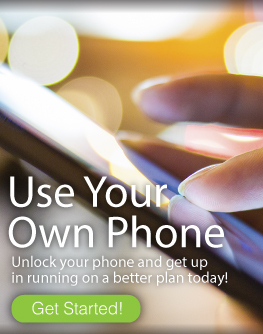 Log into your account by clicking “My Account” on the top of the HarborMobile.com page and click the "Monthly Billing"
Is there access to MyTMobile? Should I call my current carrier to cancel service once I have placed an order through HarborMobile.com? NO! - DO NOT call your current carrier to cancel until AFTER your number has been ported successfully. Can I keep my current device/phone that I have now? YES! As long as device is gsm and UNLOCKED or T-Mobile branded, you can use it on our network. 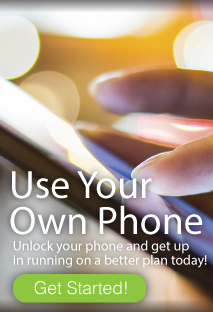 To UNLOCK your device simply call your current carrier or visit any unlocking company to get this done. What if I would like to purchase a new device? Visit shop.HarborMobile.com and click on "Shop for Phones" to purchase phones at deeply discounted prices. Is there a contract, or do I need to sign a contract to get this plan? NO! There is NO CONTRACT AND YOU ARE FREE TO CANCEL ANYTIME! Simply visit HarborMobile.com and click "Get Started" and go through our easy checkout. You will see how much you will be billed each month. On step 4 you will be prompted to contact Harbor Mobile either via phone or chat to answer any questions you might have. You will be instantly given an invitation code. Welcome aboard! Will Harbor work with my business as its needs grow, or are these your only plans? Absolutely! We strive to create affordable plans to ensure that your company's communication strategy is scalable and always affordable. Give us a try. How do I port out of Harbor? Porting out is simple (yet sad for us to see you go). Send an email to support@harbormobile.com with your request to port out. Please be sure to include your name, billing zip, number your would like to port out, and the carrier that you are porting out to. Please note that your line must be active and paid up to port out. Lines take 48 hours to be released before porting out. If you are looking to move over to your own account on T-Mobile, then please request a change of responsibility in your email to support. Do NOT try porting out your number before we have supplied you with your account number and PIN and ensured that your line has been released, as we will be unable to release your line. If you have submitted a port out request with your other carrier before being ensured that your line is released, then you must have the carrier cancel the port out request before we release your line. Voicemail passwords are set by default to the last 4 digits of the phone number assigned. If password is not working (change of number was done on the line, number port etc.) Enter #793# to automatically reset the voicemail password to the last 4 digits of the current active number on that line. International Roaming is disabled on all voice lines, and is available upon request. Data-only lines are enabled by default. In order to enable International Roaming please send us a request to support@harbormobile.com and we will respond shortly after with the International Roaming Terms. Once you respond with your consent, we will enable International Roaming on your line. International Roaming cannot be enabled within the first 30 days of service. Please note that data and text is free in the included countries (see list of countries below). In addition, calls made through WiFi Calling back to the US only, are free as well. However, calls made over CELLULAR connection while roaming outside the US or Canada, including incoming and outgoing calls, as well as voicemail retrieval, are not free and will be charged $0.35 per minute. International Roaming will be enabled for a period of 30 days. If you plan to make frequent trips abroad and would like it enabled for a longer period of time, please let us know. For support while roaming, call T-Mobile's International Support desk. Dial +1-505-998-3793 (this is a FREE call from your T-Mobile phone) or 001-505-998-3793 (from a land-line). Please note: International Roaming includes voice, text and data. However, even when this feature is enabled, it will only work in certain countries and certain parts of the world. There are places throughout the world that International Roaming will work, but at an additional charge. So before enabling this feature, be sure to check the coverage at your destination by visiting: https://www.t-mobile.com/coverage/roaming. Coverage on a cruise or ferry are not included either, and exact rates can be found using the same link. Automatic coverage in over 210 countries and destinations. Unlimited international data coverage and texting are included with all plans at no additional charge. It's just 35 cents per minute for calls to mobile devices and landlines, as well as voicemail retrieval. 1. Ensure that your APN settings are correct - epc.tmobile.com (instructions here: http://apn-settings.com/t-mobile-apn-settings-step-by-step-configuration/). 2. Change to IP6 > save > then back to IP4. 3. Is the old phone (with old provider) off? if not please turn off. 4. We can send out a phone update. This should resolve many issues. My Device is not working or it's broken, HELP! Did you purchase the device through us or our partner Zagerz.com? A) If you did NOT purchase the device from us, you may purchase a new device from HarborMobile or any other vendor. Just be sure that device is either T-Mobile branded or UNLOCKED. What is my visual voice mail default password? Your default password is usually the last four digits of your phone number. Our plans do NOT include calls to Canada and Mexico. While calls to Canada are not blocked, and you will be able to make them, there will be a charge of $1.00 per minute, plus 5% taxes and fees. Please note: this feature does not stand in effect while roaming internationally - traveling abroad. By enabling this feature, your line may become more susceptible to additional charges. Therefore, any and all charges that are associated with your line as a result are solely your responsibility. Your card on file will automatically be charged on a monthly basis for any usage charges during the previous billing cycle. The charge will be the rate-per-minute, plus 5% covering taxes and fees. What countries are included in the International data and text roaming? I have unlimited data, should I use BingeOn? Absolutely! T-mobile has a threshold of network de-prioritization after 21 GB for all unlimited plans. Streaming without BingeOn in place would accelerate your reach of that threshold. It's advisable that you utilize BingeOn and see how if you even notice the difference. Does my plan qualify for T-Mobiles BingeOn Unlimited Video Streaming? With Binge On™ and a qualifying rate plan, watch unlimited video without hitting your data bucket. Sling not available in Puerto Rico. Is the UNLIMITED 4G LTE plan really unlimited? Using the Service in connection with server devices or host computer applications, including continuous Web camera posts or broadcasts, automatic data feeds, automated machine-to-machine connections or peer-to-peer (P2P) file-sharing applications that are broadcast to multiple servers or recipients, “bots” or similar routines that could disrupt net user groups or email use by others or other applications that denigrate network capacity or functionality. How can I see how much data I have used this month? Simply dial code #932# and your phone will show you how much data you have used. Please remember that music streaming from included platforms DO NOT count against your data usage and therefor not included in this tally. Upgrading and downgrading plans as well as adding or removing features is really simple. 3. Locate the phone number that you would like to change the plan for. 5. Select the new plan and add/remove the features you wish. 6. If upgrading, the new plan will be applied to that line. The change will take effect within several hours. In addition, your card on file will get charged a pro-rated fee for the upgrade added. For example, if you are on the $30 plan, your billing cycle is on the 1st of the month, and on the 15th you upgrade tot he $40 plan, the difference is $10, but since its mid month, you will only get charged $5 to cover you until the end of the month. Upon the next billing cycle, you will get charged the new rate in full. 7. If downgrading, the effect will take place at the next upcoming billing cycle. 4. Click the PAY NOW button and the credit card that you used when service was initially established, or the last credit card that was used on the account will get charged. You can also update the credit card on file by clicking "Billing preferences" and entering it there. 5. In addition, you can always enable the convenient "auto pay" feature on the Billing preferences page so that the monthly payment is pulled each month automatically for you. We will never charge more then you authorized.